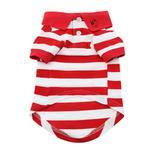 Posh pups will love the feel of this Striped Dog Polo in Flame Scarlet Red and White! The Striped Dog Polo in Red and White by Doggie Design is a sporty look with their signature logo on the collar. This 100% cotton pique polo will be a great way to have your dog stand out. This dog polo is perfect for any occasion where your dog wants to be dressy without sacrificing comfort. This lightweight polo is easy to wear with two pearlized buttons that make dressing a breeze. The tailored ribbed sleeves and high-cut stay-dry belly provide a great fit. 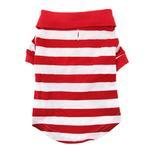 We love the vibrant stripes and red and white colors of this classy dog polo. This could be part of a patriotic outfit to be worn at parades, at barbecues, or political events. Striped Dog Polo by Doggie Design - Flame Scarlet Red and White Customer Photos - Send us your photo! Everett is ready for Bastille Day! This polo shirt is awesome for road trips across the country, is soft and comfortable and perfect for traveling and still looking your best!! Otto loves to wear his classy polo shirt for special summer occasions!! Eddy is an Aussie Shepherd/German Shepherd mix from the Austin Humane Society. I took him in as a medical foster when he was a tiny puppy and ended up falling in love and keeping him. He's quite the ham and handful. I love this shirt and consider him to be more than ready for his preppy boy modeling career. As a child of the 80s, I can appreciate a good polo shirt with a popped collar! Posted On 06/03/18 by Nancy from Tampa, FL Yes, Nancy recommends this product! Well made polo. Vivid colors, nice material and does not fade when washed. Eddy's ready to become a model for Polo! Posted On 11/13/17 by Genevieve D from Cedar Park, TX Yes, Genevieve D recommends this product! Cutest shirt ever! Eddy looks like the preppy youngster that he is. The quality is great and it fit him perfectly. The "popped collar" just added to his preppy look! We will definitely be ordering more items. Shirt runs small but very cute on. Posted On 07/07/17 by Linda F from Cottonwood, AZ Yes, Linda F recommends this product! Love their shirts that are well made and very cute! Posted On 05/30/17 by Stacey from , Yes, Stacey recommends this product! He really catches the eye in this very bright shirt. The red is a true, sharp red - and stands out. Posted On 04/18/17 by Dianna B from Ashland, OR Yes, Dianna B recommends this product! This shirt is so cute. Very well made, you will not be disappointed. Posted On 03/20/17 by kellie from , Yes, kellie recommends this product! This shirt looks so cute on my sweet boy! Can't wait to purchase more in different colors.